Asphalt and concrete are the most common materials you can use if you’re looking to build a new driveway. While both are good options, each has its own set of pros and cons that are worth considering before deciding on which is better for different situations. Asphalt goes by several names such as asphalt concrete, pavement, or blacktop in North America. It is known as bitumen, macadam or tarmac in Ireland and Great Britain. It is composed of several minerals bound by naturally-occurring asphalt (bitumen) and is used on parking lots, roads, and airports. There are different kinds of asphalt concrete and each possesses different characteristics such as surface durability, roadway noise, resistance to tire wear, and breaking efficiency. One commonly used kind is hot mix asphalt concrete or HMAC. Here, compacting and paving is done while the asphalt is hot. 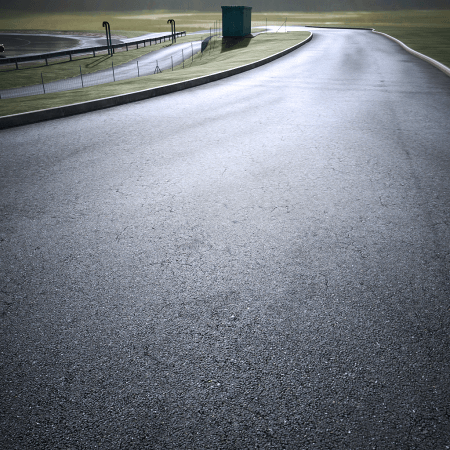 Major highways, airfields, and racetracks are made with HMAC. Porous asphalt pavement can help avoid flooding as it allows water to seep through the pavement. Warm mix asphalt concrete (WMA) allows less layering work which means less fuel consumption during construction and quicker surface availability to traffic. Generally speaking, an asphalt concrete pavement must be maintained by sealing, which is done 6 to 12 months after installation and 3 to 5 years onward. Sealing asphalt requires no special tools and maximizes the life of the pavement to at least a few decades. Cracks on asphalt are easy to repair and can be topped off with a new layer if the old one is already beyond repair. A square foot of asphalt costs an average of $2.50 to $4.00. In terms of finishing, asphalt does not offer too many options as it has to be rolled and compacted. This leaves limited time for a custom finish, although a few options are available for applying custom colors and patterns on an existing asphalt surface. Concrete is a combination of construction aggregate materials such as sand, crushed stone, gravel, recycled concrete, slag, and other geosynthetic aggregates. This mixture bonds together with the help of liquid cement and takes several days before it can be driven on. One of the most commonly used concrete is the lime-based Portland cement concrete. Asphalt concrete is a type of concrete mainly used for road surfaces. Concrete is usually easy to work with when it comes to creating finishes. It can be stained to show various colors and custom patterns. 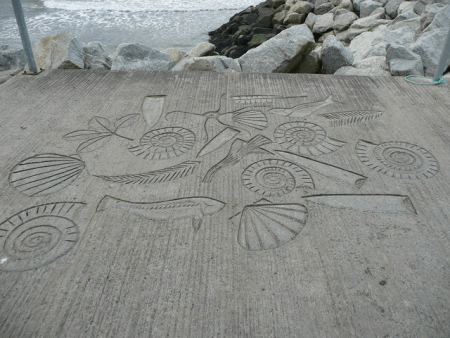 Designs can be stamped, engraved, etched, and sketched into concrete to achieve a unique look. Climate plays a crucial role when using cement in road surfacing. It can develop cracks and frost heaving in extremely cold winters. Salt from melting snow can also cause pits on concrete surfaces, leaving unsightly blotches. A concrete driveway can last up to 50 years even without sealing, but doing so can preserve its look and finish. Concrete stains easily, but a degreaser can help remove oil stains from the surface. Experts recommend sealing every couple of years to preserve a driveway’s custom finish and design. Repair work on surface cracks is considerably noticeable over time. Installing a concrete driveway can cost anywhere from $4 to $6 per square feet or even more if color finishes and designs are added. A stained concrete driveway may cost more than $15 per square foot. So what’s the difference between asphalt and concrete? While asphalt is a type of concrete, both have different characteristics that warrant their use in different situations. Asphalt binds with other aggregate materials with the help of naturally-occurring asphalt, while concrete requires only water and liquid cement to bond with other materials. Asphalt offers limited options for custom designs and colors. Concrete, however, provides greater options for customization such as stamping, etching, and color tinting. Even the texture of concrete can be changed. High summer temperatures can soften and deform the tar on asphalt concrete. Its dark color makes it absorb even more heat. When this happens, a motorcycle’s kickstand can dig right into asphalt concrete and cause damage. On the other hand, concrete cracks in extremely cold winter conditions. Salt from melted snow can cause a pitted surface, which in turn, leaves a blotched concrete surface. Resealing asphalt can extend its longevity to 20 years and beyond. Asphalt requires resealing every 3 to 5 years for superior results. Concrete can go for 50 years without any need for resealing. Asphalt can cost anywhere from $2.50 to $4.50 per square feet while concrete is a bit more expensive at $4 to $6. Here’s a YouTube presentation talking about the difference between asphalt and concrete.